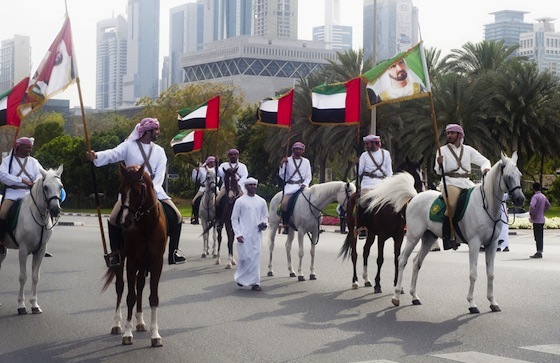 Not to be outdone by Masdar City in Abu Dhabi, Dubai will soon begin construction on its own ‘sustainable city,’ where green transportation options include horses. Lest it seem that the new 743,000m2 development project entails a remarkable step backward, solar-powered vehicles are also planned, which is every bit as ambitious (and unlikely) as Masdar’s long-since-abandoned zero carbon, zero waste pipe-dream. Last April Diamond Developers announced their plans to build an elite ‘sustainable city’ for 10,000 residents or 2,500 families. Groundwork is expected to be laid this year for construction, which will be complete by 2016 – if all goes according to plan. Complete with 70% green space and organic farms, and an 8km stretch of planted Qaaf and Date Palm trees, the solar-powered urban development is expected to produce 75% less carbon emissions than a standard Gulf city. Waste will be handled locally and sewage water will be treated and then recycled, a boon for a region that has access to virtually zero freshwater resources. Diamond Developers has also provided space for a mosque, government offices, and a university that is expected to promote studies in environmental sciences. Whether or not new developments such as these are the appropriate response to global climate change and other environmental challenges remains to be seen. As a somewhat elitist project (the compound will also feature a 143-room “green” resort), projects like Masdar and Dubai’s new ‘sustainable city’ only offer solutions to a select few wealthy inhabitants and more needs to be done to ensure that all residents can live a healthier, less energy-intensive life in the United Arab Emirates. First Middle East Carbon Market – in Dubai! I wouldn’t really call horses “green” transportation. You have to feed and water them, groom them, and clean up their poop – which often is deposited on streets and roads by the animals themselves. Also, referring to horses as a “green” transportation solution is like retreating back in time to the 19th Century. We’re supposed to be going forward, right? Not backwards.